Day 154 - First Digitizer Print! 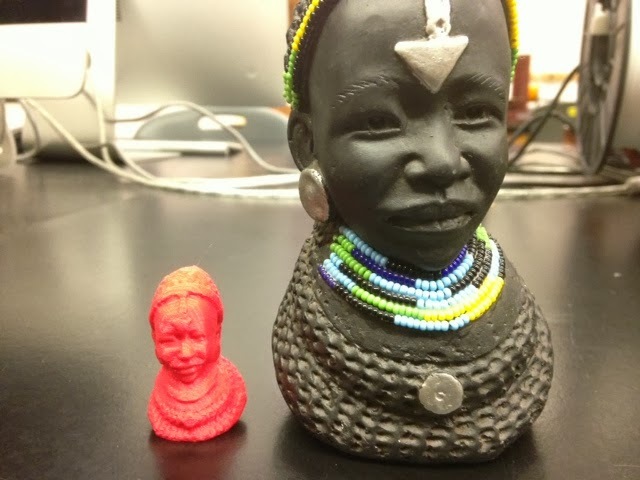 To break in the new MakerBot Digitizer in the JMU 3-SPACE Classroom, my student Patrick scanned and printed a beautiful African woman statue that another student gave me as a gift many years ago. It came out great, with lots of the details intact even with a small print. (This model is also a prototype of a game token that will be part of a later project, so stay tuned.) Does it count as a "print from home" if this print was made at work, and not even by me? It's my blog and I''m really excited about the Digitizer so yes, yes it does. Settings: MakerWare .2mm/standard. Although we nearly always print in .3mm/low, in this case we wanted to catch some of the finer details.